Astronomers observe 4 special Holy days in each year. The Winter and summer solstices and the vernal and autumnal equinoxes. An equinox occurs twice a year, when the tilt of the Earth’s axis is inclined neither away from nor towards the Sun, the center of the Sun being in the same plane as the Earth’s equator. The term equinox can also be used in a broader sense, meaning the date when such a passage happens. 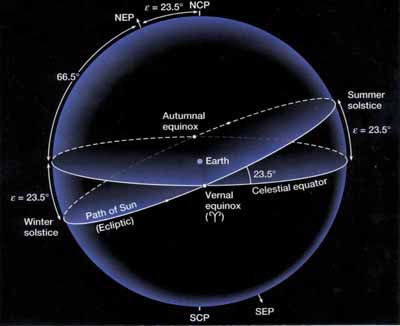 At an equinox, the Sun is at one of two opposite points on the celestial sphere where the celestial equator. A solstice is an astronomical event that happens twice each year when the Sun’s apparent position in the sky reaches its northernmost or southernmost extremes. The name is derived from the Latin sol (sun) and sistere (to stand still), because at the solstices, the Sun stands still in declination; that is, the apparent movement of the Sun’s path north or south comes to a stop before reversing direction. The term solstice can also be used in a wider sense, as the date (day) that such a passage happens. The solstices, together with the equinoxes, are connected with the seasons. In some languages they are considered to start or separate the seasons; in others they are considered to be center points, in the Northern hemisphere, for example, the period around the June solstice is known as midsummer, and Midsummer’s Day is 24 June, about three days after the solstice itself. Similarly 25 December is the start of the winter celebration, and is the day the Sun begins to return to the northern hemisphere.